The classic surgical atlas, more comprehensive than ever! For more than half-a-century, Zollinger's Atlas of Surgical Operations has been the gold-standard reference for learning howto perform the most common surgical procedures using safe, well-established techniques. The tenth edition continues this tradition of excellence. The atlas covers gastrointestinal, hepatobiliary, pancreatic, vascular, gynecologic, and additional procedures, including hernia repair, vascular access, breast procedures, sentinel lymph node biopsy,thyroidectomy, and many more. The illustrations in this atlas have withstood the test of time. They allow you to visualize both the anatomy and the operation, making the book useful as a refresher or for learning the steps of a particular procedure. 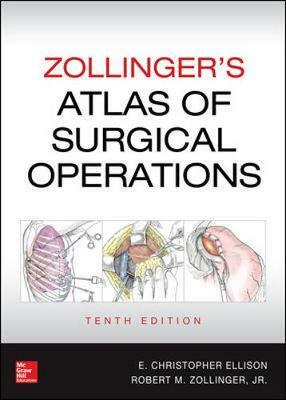 The tenth edition of Zollinger's Atlas of Surgical Operations expands the content to include 19 new operations. Each chapter contains beautifully rendered line drawings with color highlights that depict every important action you must consider while performing the operation. Each chapter also includes consistently formatted coverage of indications,preoperative preparation, anesthesia, position, operative preparation, incision and exposure, procedure, closure, and postoperative care.